Ris Lacoste is definitely a Foggy Bottom West End Village Star Chef. She's bringing her talent and locally sourced, sustainable food to the FBWE Village Gala. In her role as village culinary adviser, she is helping us design the menu and pick out featured restaurants and star chefs. RIS is Lacoste's "upscale neighborhood cafe," located at 23rd and L NW, on the ground floor of the Residences of the Ritz-Carlton. RIS serves inspiring, locally- sourced, sustainable New American fare. Ris Lacoste is an icon of DC dining. Trained in Paris where she earned a Grand Diplome from Anne Willan's La Varenne Ecole de Cuisine, she participated in a number of openings for District restaurants such as Vidalia. In 1995 she became executive chef of Georgetown's celebrated 1789 restaurant. 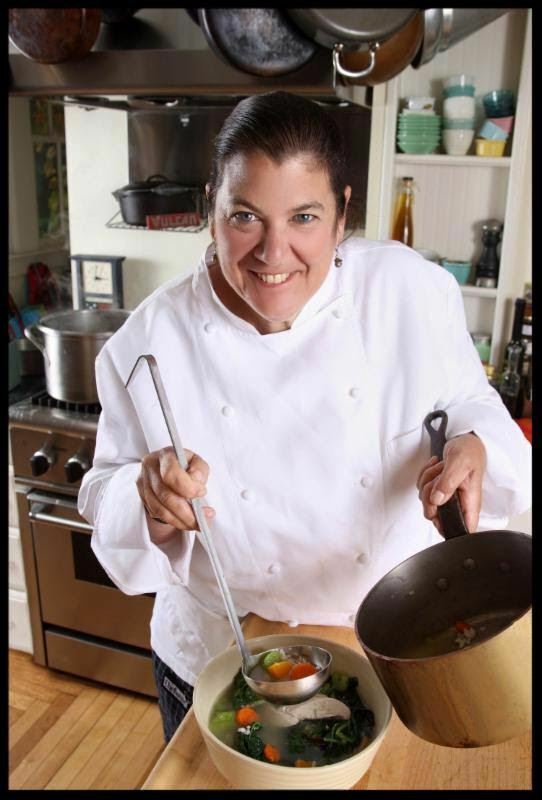 Her innovative, regional American cuisine has earned her many awards including those from Wine Spectator, The Washington Post, Washingtonian and a coveted nomination from the James Beard Foundation (JBF). In 1999, the Restaurant Association of Metropolitan Washington (RAMW) named Lacoste Chef of the Year. She's also competed in Food Network's Iron Chef. And, as if all that weren't enough, she actively volunteers and mentors in the community. As a writer, Lacoste is a regular contributor to Fine Cooking Magazine. In 2002, she created the PBS documentary Cooking with Julia in honor of Julia Child's 90th birthday. Lacoste's chef demonstrations allow her to showcase "the importance of investment in the local community and dedication to the ideals of local and sustainable farming." Lacoste is also the Gala culinary adviser helping FBWEV Gala planners lure more star chefs and colleagues to the annual event. So far these include not only RIS but also Rasika West End and the Kingbird, the restaurant in the newly reopened Watergate Hotel. are $95. Salon tickets are $75 each. Foggy Bottom West End Village (FBWEV) steering committee members are Lynette Asselin, salons; John Seichter and Mary Bernstein, donors and sponsors; C.B. Wooldridge, decorations; Lorna Grenadier, logistics; Leah Schroeder and Peter Sacco, co-chairs; Monroe Wright, auctions; Sally Willis, check-in, and Jane Scholz, publicity and ticket sales.